On December 10th, news agencies in Malaysia reported the first death in the country from Influenza A (bird flu).1 Previously, Malaysia has claimed to be ‘immune’ from the bird flu epidemic which has hit neighboring countries, particularly Indonesia over the past decade. Even when the SARS outbreak hit in 2002, Malaysia did not have any recorded records of the disease (despite a higher than average number of deaths from flu-like cases). However, some suspicion was raised when the media later announced that the death was actually caused by a thyroid complication, rather than Influenza A, or bird flu. More alarming, was the fact that reports came out that three of the victim’s colleagues had been quarantined in the hospital as they had tested positive for H1N1 – of which bird’s flu is a strain.2 The question can then be asked, that if the victim who died had thyroid complications, then why did her colleagues test positive for H1N1? This recent announcement thus caused considerable alarm amongst Malaysia’s NGOs and civil society groups, such as the Penang Heritage Trust (PHT) and Friends of the Earth Malaysia (SAM), who have been concerned for a number of years with the high population of swiftlets in the city of Georgetown, Penang (as well as many other Malaysian cities), which are reared in an intensive manner for their valuable edible-nests.3 The NGOs’ concerns have been justified due to a recent outbreak of H5N1 bird flu in Vietnam in May 2013, which resulted in the deaths of thousands of swiftlets and one child in the Phan Rang area of south-central Vietnam.4 This case provided the first indication that swiftlets are susceptible to the bird-flu virus, as many swiftlet farmers and biologists alike indicated that swiftlets were unlikely carriers of such vectors due to their unique characteristics. 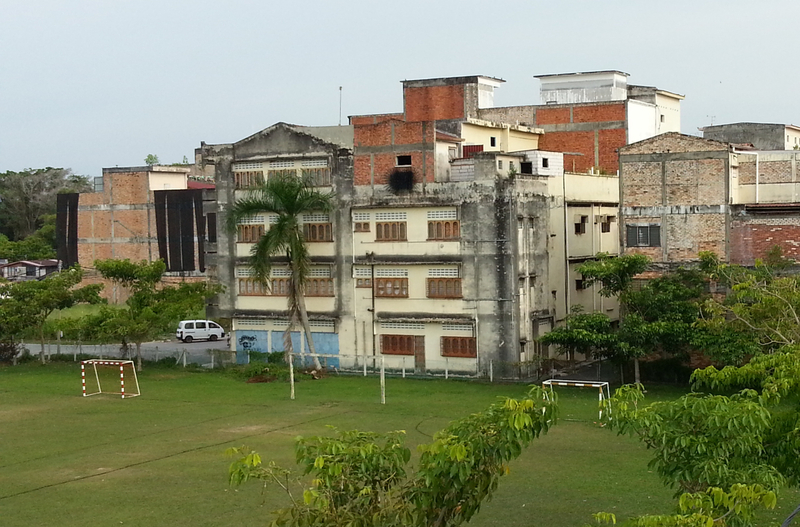 A cluster of swiftlet farms in Sitiawan, Perak, located adjacent to a school playing field. Sitiawan is a town some 200 hundred kilometers from Georgetown, where the industry started in Malaysia. The town’s central area has been almost entirely converted to swiftlet farming over the past 15 years. 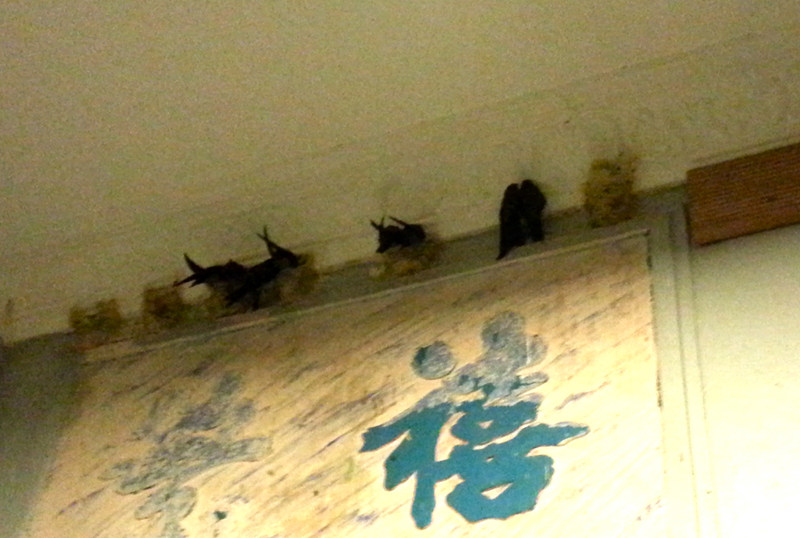 Baby swiftlets occupying their nests. During the day, the adult swifts will go out and scavenge for food to bring back for their young. Wooden planks are attached to the cement walls of swiftlet farms for the birds to perch on while constructing their nests. The PHT has been lobbying for a ban on swiftlet farming in the Georgetown urban area, which is listed as a UNESCO World Heritage Site, since 2007 when the first government guidelines on swiftlet farming (known as 1GP) first appeared. These guidelines explicitly stated that swiftlet farming should not take place in residential areas. December 31st of 2013 marked the end of the Penang state’s three-year grace-period for the removal of all Swiftlet farms in the city of Georgetown. In a recent interview that I had with YB Chow Kwon Yeow of the Penang state government, he prepared a large document outlining for me the history of the government’s involvement in regulating the issues related to swiftlet farms in the central city area. The policies date back to 2008, when the town received UNESCO world heritage designation, and coincidently, when the current state government came into power. Since then, Chow’s government has been under a lot of pressure to clear the city of swiftlet farms, as the buildings themselves and the birds they attract have been been widely identified as a social nuisance in the town, as well as the possible source of health hazards from diseases like dengue fever and bird flu. However, Mr. Chow candidly told me that, despite having some problems early on, the number of swiftlet farming premises in Georgetown has been greatly reduced and should be down to less than a dozen in 2014. Despite Mr. Chow’s optimistic outlook on the number of swiftlet farms in the Georgetown World Heritage Site, there are still several concerns, as addressed in a recent open letter issued by the PHT to the State Government in Penang on December 30th, 2013. The letter wanted clarification on the state’s definition of ‘shutting down a swiftlet house’, because the PHT has not been convinced that the premises have actually been ‘shut down’ in a permanent manner. For instance, it is one thing to remove the tweeters and sound systems used by swiftlet farmers to lure in potential birds (as documented in several high profile press releases), 5 but another to completely seal up the windows and entry ways until the birds no longer return. Another concern raised is the ‘true’ status of bird flu in the state of Penang, in view of the recent bird flu/H1N1 scares discussed above; as well as rising incidence of dengue fever in Penang state.6 Finally, there are the general concerns by the PHT and members of the public alike regarding issues of transparency and responsiveness on behalf of the government – particularly in regards to public health threats and public nuissances, such as bird flu. Hopefully now that we have emerged into 2014, the state of Penang will fulfill its promises of clearing Georgetown of most of the existing swiftlet premises. Municipalities in Malaysian Borneo, such as Kuching, which I also visited briefly during my ongoing field research on this topic, have been largely successful in minimizing the numbers of swiftlet farms within the urban area, while others like Kota Kinabalu are now following suit.7 Granted the legislative context in Borneo is different from that in Peninsular Malaysia, but hopefully cities like Georgetown can learn from these successes in the near future. On a final note, it should be clear that the point of this piece is not to demonize the lucrative swiftlet farming industry, nor to call for an outright ban on this business in Malaysia – far from it. Rather, it is to bring the struggles over urban swiftlet farming in Malaysia, which are at once cultural, economic, ecological, and political, to a wider international audience. It is also to help push forward the calls within Malaysia for the swiftlet farming industry to be reconfigured in a manner that is more socially (and ecologically) just, and does not put Malaysia’s urban residents at risk from disease, or other socio-economic impacts. 2. Due to a host of intersecting factors, the price of edible bird’s nest, which is made almost entirely out of the swift’s saliva, skyrocketed in the 1990s, which led urban residents across Malaysia to begin converting low-rise shop houses into ‘swiftlet farms’: cave-like bunkers used to attract swiftlets (see photos 1 and 2, above), and harvest their nests in a more efficient manner than was possible previously. Swiftlets traditionally make their nests in caves throughout Southeast Asia, where harvesters would carry out the high-risk work of collecting their nests from the cave walls. 5. Kaur, M and Yeoh, W., 2011. ‘Swift action on swiftlet breeding: Next enforcement on 94 operators to begin next month, says chow’. Star Metro, M4. 25 February 2011. This entry was posted in News & Updates and tagged Environment on February 3, 2014 by citiesmcr. Its the age old problem of people wanting the dignity of a living wage but potentially damaging the ecosphere whilst doing it. Only education can cut through the issue.